I’ve been busy at work lately, and have had difficulties to find stamina to cook after hours. This weekend is a long one however because on Monday we celebrate the 1st of May, and it is a public holiday. It’s also pretty safe to say that the outside temperature will finally stay above freezing point until the inevitable new winter after a few months, and I’ve been able to walk outside without mitten and a scarf. To me this means one thing only: BBQ Time! I’ve always loved grilling, smoking, and barbequing – generally spekaing anything which involves playing with fire :) In Boston I was devastated as I didn’t have a place for a grill. Every time I went to a Home Depot and walked by the long lines of gas and charcoal grills my heart was bleeding. One of the very last things I did in the States before moving back to Finland was buying a couple of Weber grills. They’re horrendously expensive here in Finland, but very reasonably priced in the US. The movers had already packed all my belongings into an ocean container when I drove to the moving company’s warehouse with two huge cardboard boxes and asked them to ship them too. Interestingly I’m not apparently the only crazy European hauling grills from one continent to another. The sales assistant at The Backyard Barbeque in Framingham (where I bought my Weber Q gas grill) told that quite a few people tell them they’re taking the grills to Europe – even as a flight luggage! But long story short – I have now two nice grills at my disposal, and since the weather was nice, my tummy grumbling and my inner vegetarian squelch by my inner carnivore, I called my brother and asked if he fancied some BBQ. Not surprisingly the answer was affirmative, so I headed to a trusty butcher shop in a nearby mall. I was supposed to buy half a kilo or so of tenderloin (fillet mignon), but then saw Argentinian Beef Angus prime rib roast (entrecôte) on sale. In the States prime rib had been my ultimate pleasure, so I basically impulse bought a 2.5 kg (5.5 lbs) slab of the prime rib roast. This decision would inevitably affect our lunch schedule, effectively turining it to a dinner instead. While my brother was preparing the fire, I made a dry rub for the roast. I ground the dry spices in a mortar to a coarse powder, which I patted and rubbed all over the roast. The spices stick better if you moisten the meat with water first. 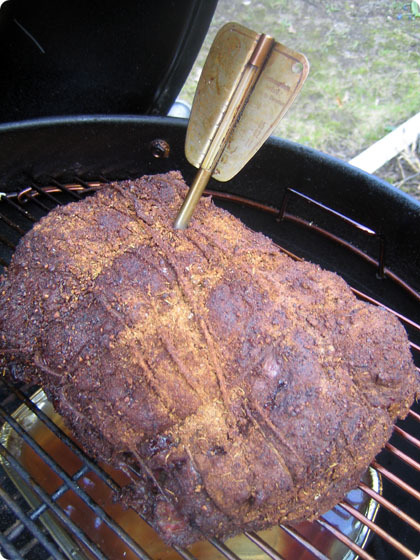 The first picture shows the roast with the dry rub applied. 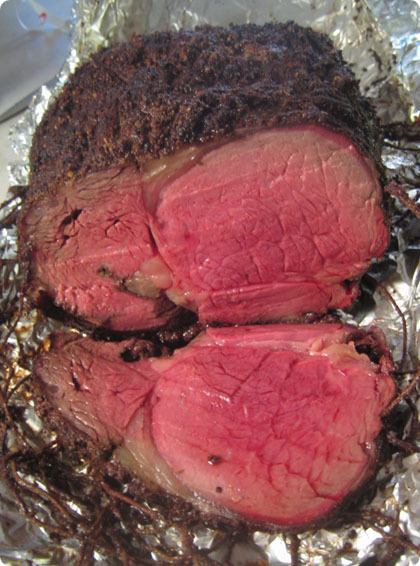 The roast may look small in this picture, but that’s only because the grill is huge – its diameter is 22.5″ (57 cm). I wanted to smoke the roast, which calls for an indirect cooking method. The coals are on the other side of the grill, and the roast on the other on top of a water-filled drip pan. When cooking with a Weber kettle, it’s important to keep the lid on at all times, as it reflects the heat back like a convection oven. When grilling steaks, quick and hot is ok. When smoking, the temperature is kept low and the meat is cooked for a long period of time. My 2.5 kg roast took 2 hours 45 minutes in the grill, plus an additional 15 minutes in an oven, after which I kept it wrapped in a foil for another 30 minutes to post-cook and keep the jus. A rough 120 C (250 F) is a desired lid temperature when smoking, albeit some prefer higher, some lower temperatures. I’ve found this to be an ok temp. In a Weber kettle, keep the top vents open, and control the temperature with the lower vents. And don’t let the coals burn out! Keep adding them every now and then during the cooking, but don’t keep the lid open for too long. When the internal temperature of the roast has reached 46 C (115 F), remove it from the grill, and put in a preheated 200 C (400 F) oven for 15 minutes. After that, wrap in a foil for 30 minutes before carving. Stockyard, my favorite steak house in Boston often served horseradish sauce on the side of the prime rib, so that’s what I use at home too. Heat the sauce in a microwave for a little while before serving. Don’t throw the jus away, but bring also to the table with the horseradish sauce. Mashed or baked potatoes or sweet potatoes make a perfect side dish for the roast. 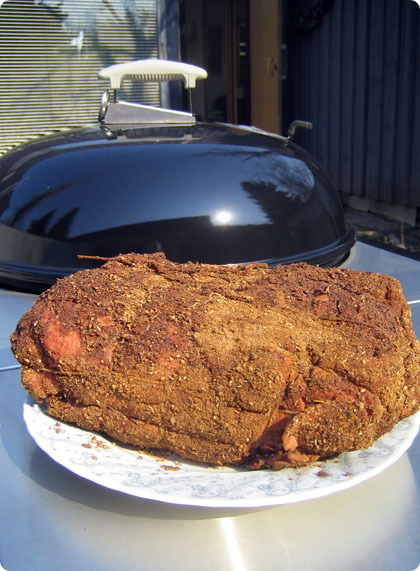 Ground everything into a coarse – semi fine powder, and rub all over the roast. Wet the meat beforehand slightly with water to help the rub to stick. Oh! That looks so good! I have been sick with the flu this weekend but that roast has revived me. It’s perfectly cooked. And I’m very glad to hear that your days of not being able to grill are behind you. Lovely color! It looks so good! relly: Thanks for stopping by! Good to see real barbecue stuff being cooked. Let’s hope the slow, indirect cooking fashion finally catches fire :) in Finland. For some reason, backyard grilling is all about high heat and thin cuts of meat – at least up here in Oulu. Then the devoted fathers – having this one time acquired the sole responsibility for the meal – worry their backsides off not to burn the meat and disappoint the ladies. So guys – just take a good, rough cut of quality meat, set up the barbecue in low-to-medium indirect heat and basically let the grill do the worrying. The process takes so long it’s quite hard to overdo it completely. Plus, it gives the cook more time to enjoy the summer and a set of tasty beverages. Let the summer roll in! Ribs are fabulous! Do you have any good BBQ sauce recipes? That kind of ones, which make the meat nice and sticky when applied on the meat towards the end of the grilling. Ribs shouldn’t be any more difficult than the roast – just keep the heat low enough and barbecue until the meat starts to tear off the bones. By the way, why the 15 minutes oven period in that roast posting? Pippurimylly: I haven’t tried making BBQ sauces in years, but that’s definitely something I need to start investigating. Last fall I brought ~20 kg of various sauces from the States, and still have plenty left, but when I run out, I’ll start cooking them myself. I especially like Carolinas style mustard sauces, and Texas style sauces. The oven period was suggested by some BBQ pro, so I just followed the orders. I think it gives a nice crust, and some extra heat just before the meat is wrapped in a foil. At least the skin became very nice & moist that way. that looks perfectly cooked! juicy and delicious. it’s hard to ensure your meat comes out as perfectly as that. well done! your article was what I needed. Very good recipe I will attempt this weekend! The rib roast in the Weber kettle looks like the perfect idea for Vappu (next Tuesday!). I have a Weber kettle but what is the Finnish for “rib roast” and can I get a good one in Espoo or do I have to go to Reinin Liha? Is it on the bone? I get so confused with the names of cuts of meat between British, American, French… now Finnish Arrrghh! I guess you used beef but can I do this with elk? 3) When you place the meat, add 5-7 extra charcoal pieces, these will keep the heat going longer so you do not need to add more and lose valuable heat. Enjoy! 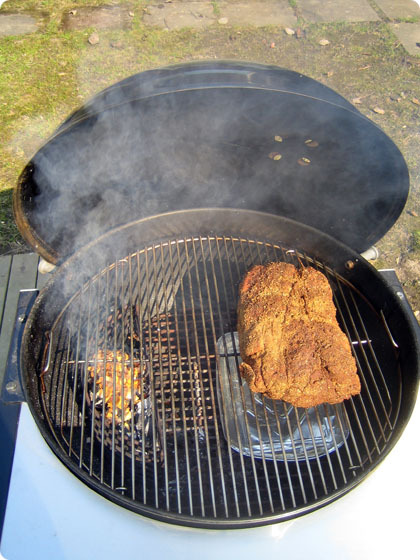 Hi…when I grill on the Weber I put a bottle or can of beer into the drip pan. A beer like Bud will keep the meat moist and add a little flavor, but my favorite beer to use is Sam Adams…though it pains me to not be able to drink it as it is such as good beer! I’m not a BBQ guru but use this method with just about any roast I make on the Weber and I’ve always been happy witht he results. I use my charchol Weber year round and even a few days ago in a heavy snow I made an awesome pork roast and ribs. I do put chunks of wook over the charchol just after placing the meet on the grill, and just before closing the kettle.